There’s a long history of officially-branded Gran Turismo wheels. 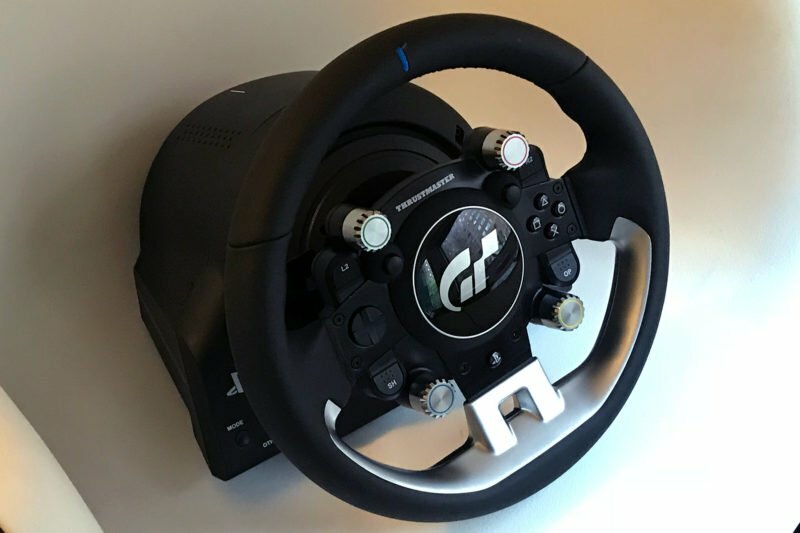 Starting out with Logitech’s GT Force way back in the days of Gran Turismo 3: A-Spec, Polyphony moved to a partnership with Thrustmaster almost a decade ago. The latest fruit of this collaboration is the wheel you see here, the T-GT. GT Sport players should be plenty familiar with the T-GT. It’s been front and center over most of the game’s development, from as far back as the London reveal event, where it was originally suggested to be a direct-drive item. 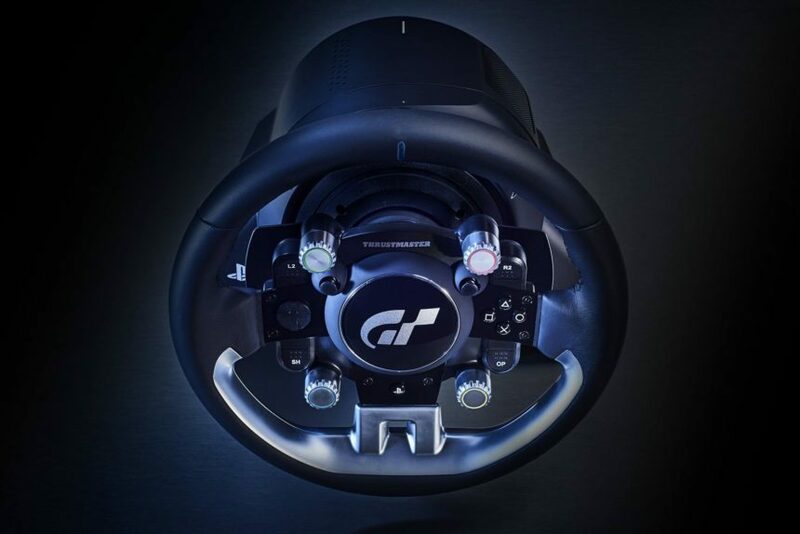 While that turned out to not be the case, the T-GT is the most powerful wheel setup Thrustmaster makes for consoles. So how does it stack up? I put it through hundreds of miles of testing across Gran Turismo Sport, F1 2017, Project CARS 2, and Assetto Corsa to find out. 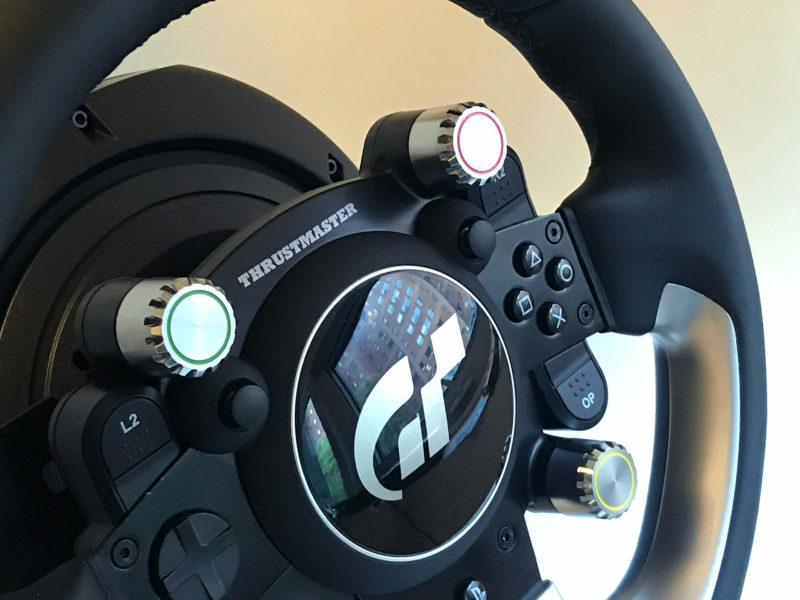 Thrustmaster sent me a T-GT to review alongside its new BT LED display (read our review of that here). The rig used for the review was from GranStand (review here). First impressions are quite good. Opening up the box, I smell the T-GT before I see it. Clawing past the protective styrofoam, I spy the wheel rim. Yep, that’s real leather alright. 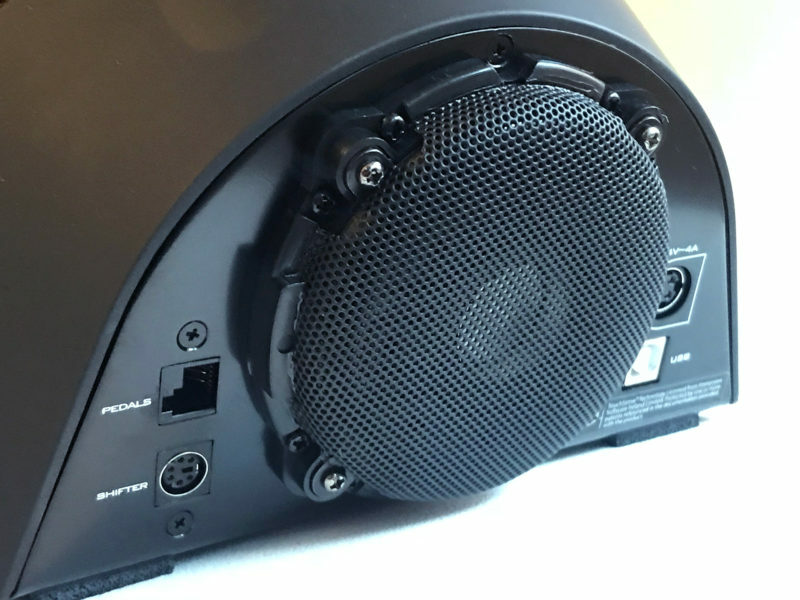 The base itself is a dense bit of kit, adding to the sense of quality. I’m a fan of the asymmetric design; it’s cool and modern without being over-designed. The matte black plastic parts look good too, though they collect finger prints at such a rate you might think you’re haunted by sim racing ghosts. Other plastic parts are less good, chiefly the pedal base and the silver bit on the wheel itself. The former is a bit of a surprise at this price point: the T3PA pedals certainly aren’t bad, but a bespoke set wouldn’t go amiss. The latter is, admittedly, more of a preference issue. For me, the silver looks fake, and the odd cutline along the bottom of the rim doesn’t do it any favors. If this part were black, it’d look more convincing. The other silver parts — the four GT-specific rotary dials — are much less jarring. These all have a satisfying click to them, a feature they share with the rest of the buttons on the T-GT’s spokes. No matter the length of a driving session, the T-GT never shows any signs of force fade. It’s also incredibly quiet — typically, the PS4’s fan is louder. The leather on the wheel feels great, but there’s very little padding underneath it. It’s also on the small side at 11″. Small diameter and plastic pedal base aside, the T-GT feels like a seriously high quality item. But really, am I the only one who finds it strange there’s no on/off switch for the base itself? As you’d expect of a wheel emblazoned with a big GT logo, this is a PlayStation compatible wheel. The T-GT will also quite happily function on PC. But Xbox support, for a full triple threat a la Fanatec’s CSL Elite, just isn’t possible here. 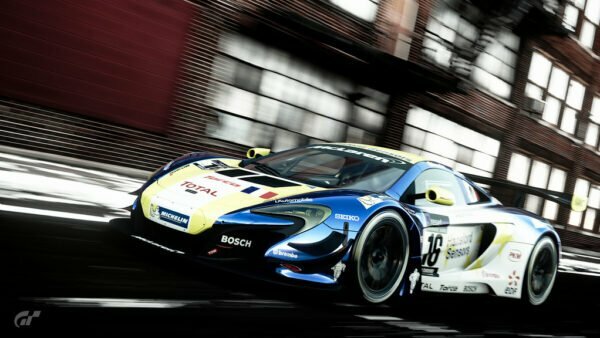 The T-GT takes the compatibility question one step further with unique features for Polyphony Digital’s sim racer. 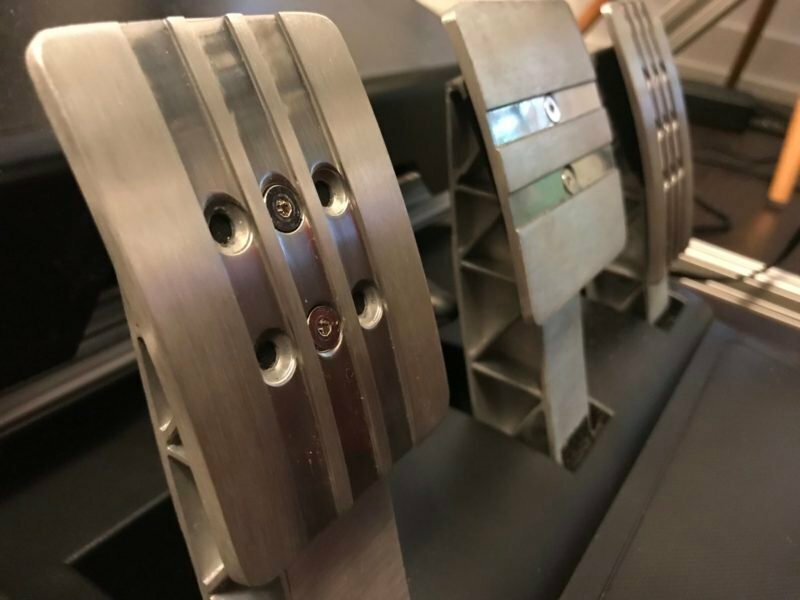 Not only do those rotary knobs all take care of multi-function display (MFD) parameters in GT Sport, but a quick peek at the back of the wheel base gives you a look at the pièce de résistance. 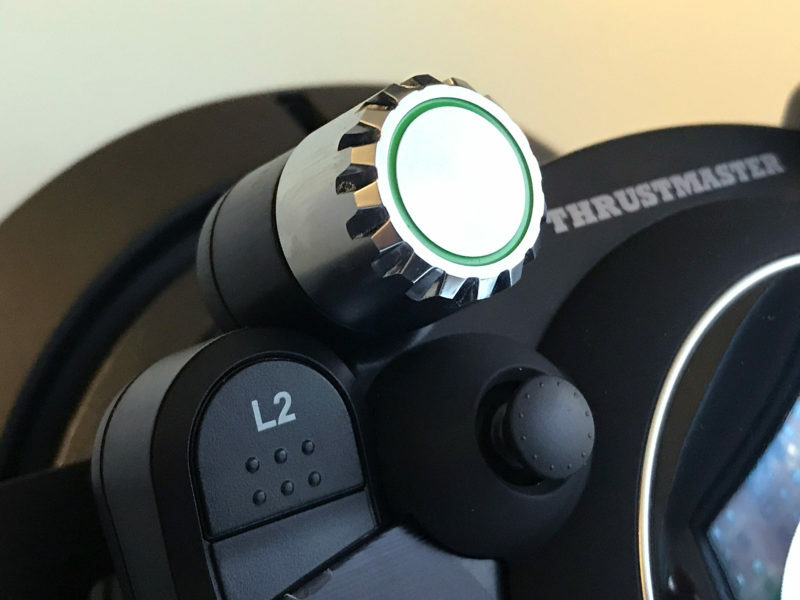 Thrustmaster calls it T-DFB (“Thrustmaster Depth Feedback”) — think of it as a sort of Buttkicker-style machine mounted directly on the steering column. 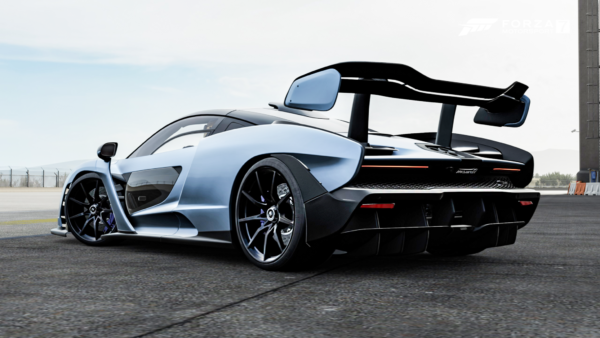 It’s something I’ll explain in more detail in the Features section, but know that currently, it’s a Gran Turismo exclusive. It’s a very cool bit of kit, so it’s a shame Polyphony and Thrustmaster won’t open it up to other developers. 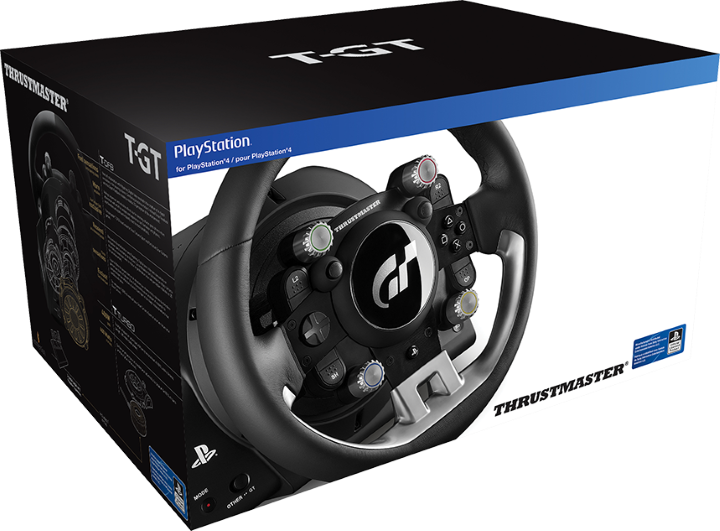 In terms of the Thrustmaster ecosystem, the T-GT will accept any and all wheel, pedal, and shifter add-ons. You’ll need a TH8A shifter to get the most out of that clutch pedal, but Thrustmaster’s new TSS sequential/handbrake hybrid is an option too. If you want a bigger, simpler rim, there’s the Sparco R383. It’s not often you focus on the back of a wheel base. But this is the T-GT’s party piece, the T-DFB. Let’s talk that transducer. Thrustmaster worked with Polyphony to specifically develop it for GT Sport, and it shows. This isn’t my first drive with the T-GT. I first got behind the wheel at E3 2017, where it was hard to get a definitive feel for the T-DFB system. It doesn’t take long to re-familiarize myself with it, however, as it makes its presence known quite often in GT Sport. Initially, it feels strange. If this were any other wheel, you might think something was broken thanks to the odd buzzing sensation. What makes T-DFB so impactful is its near-constant nature, though. After a few laps, it worms its way into your muscle memory, with subtle variations — complemented by the traditional FFB — informing you of what’s going on at the surface level. By the end of an hour it feels remarkably intuitive, specifically at gauging understeer. With the latest GT Sport update (as well as the switch to weekly Sport Mode races), I find myself at Suzuka in the Cayman GT4. 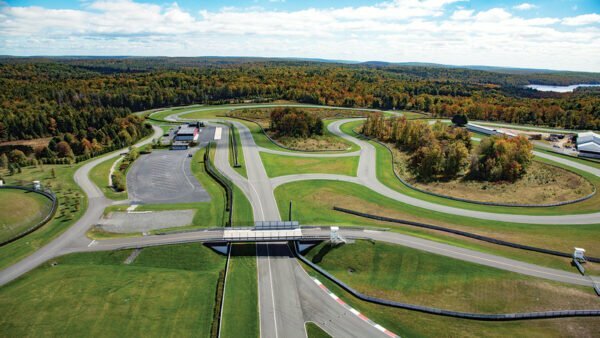 It’s an ideal test bed, with the Japanese circuit’s S-bends requiring smoothness and controlled speeds for the best lap times. Here, the T-GT is a great dance partner. Work past the smallest bit of deadzone at the center of the wheel and you find a consistent level of resistance. Push even a single mph past the tires’ limits and before you even hear it from the game, you sense it through the wheel. Ease off the throttle, tuck the nose in, and watch the lap times drop. T-DFB isn’t as forthcoming on what the rear tires are up to. There’s an inkling, so you’re not completely in the dark, but it isn’t the HD message that comes from the pointy end. Despite not making use of the fancy transducer, Assetto Corsa feels just as good. The way the wheel responds to understeer and oversteer is very natural. Here, I take a 718 Cayman S around Brands Hatch. It’s the same car I enjoyed on track at Silverstone last year, and it feels remarkably similar. Without T-DFB, I’m able to get a feel for the rest of the T-GT package. The FFB is strong, smooth, and consistent, like a good stout. I can’t imagine many folks complaining it needs more power. Project CARS 2 fairs less well, though I chalk that up to my existing in-game FFB settings. There’s no feedback when the tires lose grip, and the wheel does an odd sawing motion at the exit of most corners. That said, it definitely translates bumps in the surface to my hands! Finally, there’s F1 2017. Yes, this isn’t the rim shape for it, but the T-GT feels surprisingly good out of the box. Like PCARS2, there’s not a lot of warning if the rears have run out of grip, but that’s not often a concern here. The T-GT does give you ample warning about the fronts though. The wheel is heavier here than any other title — so much so, in fact, that a prolonged stint in the Career Mode left my right thumb slightly bruised. I regret nothing! There are two major flies swimming in the T-GT ointment. The first is the pedal set. This is essentially the same setup you’ll find in the T300RS, which retails for half the cost of the T-GT. The plastic base is a fairly minor issue, and the pedals themselves are solid chunks of metal. They’re adjustable too, at least the clutch and throttle. But that middle pedal lets the side down. It’s a simple travel-based setup, not a load cell. The conical brake mod helps slightly, providing some level of resistance, but it’s a blunt instrument. 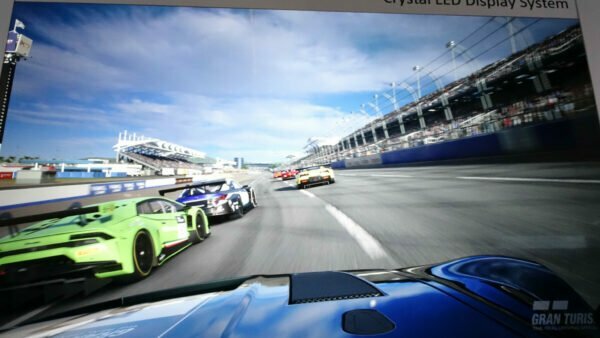 There’s a palpable disconnect while driving, especially in GT Sport. You’ve got an innovative, feedback-rich setup in your hands, but the pedals force your feet to memorize position instead of pressure. It’s a mix of old and new, but not in that Singer 911 style. The paddle shifters are less of a problem, but still come in for minor criticism. Simply put, they’re too small. They have a nicely audible click to them, much like the face buttons on the front of the rim, but they travel across a smooth range of motion. I’d rather a more notched feel, with a more tactile sense of engagement than an audible one. But hey, horses for courses. You’ll want to use these just for the tactile delight! There’s no avoiding it: the T-GT is expensive. 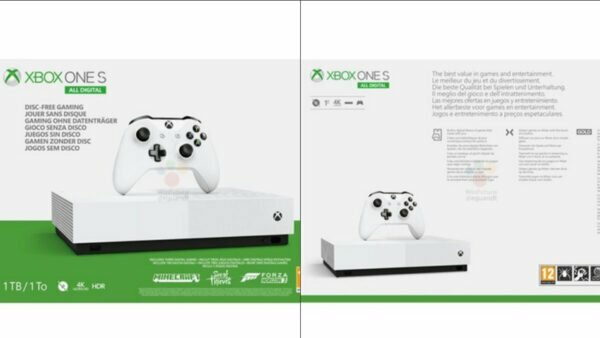 At $800, it’s twice the price of a T300RS (or a PS4 Pro). While it offers more power than its little brother (even in non-GT mode), it uses the same pedal set. You’re paying for what Thrustmaster has hung off the far end of that wheel base. 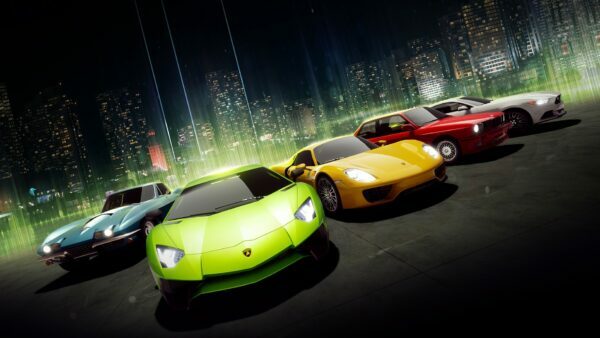 That basically morphs the value proposition into a game one: how big of a Gran Turismo fan are you? The T-DFB system offers a level of feedback in GT Sport that’s literally unique. Plus, those dials are tailor-made for adjusting the MFD on the fly. If you play no other racing games, but are very serious about your sim rig, then the T-GT is the best option. But that sounds unlikely; if you’re that serious about this crazy hobby of ours, you probably play other titles too, be it on PS4 or PC. And any time you do, T-DFB is a paperweight. The T-GT essentially becomes a more powerful T300RS at that point. The biggest like-for-like competitor to the T-GT is Fanatec’s CSL Elite PS4. If Xbox compatibility is a non-issue for you, the Elite PS4 plus the LC load-cell brake kit can be had as a package deal for $630. 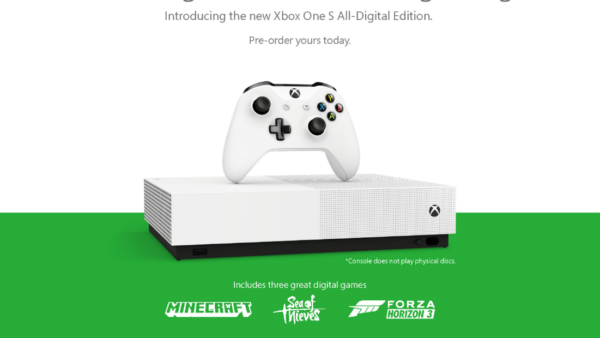 Full three-platform support can start at $690. You’d be trading those GT-exclusive features for a better pedal set and increased in-wheel feature tailoring, however. It’s hard not to like the T-GT. It looks good, it feels good, and it performs flawlessly. Fittingly for its place atop the Thrustmaster tree, it’s the best wheel the company makes. 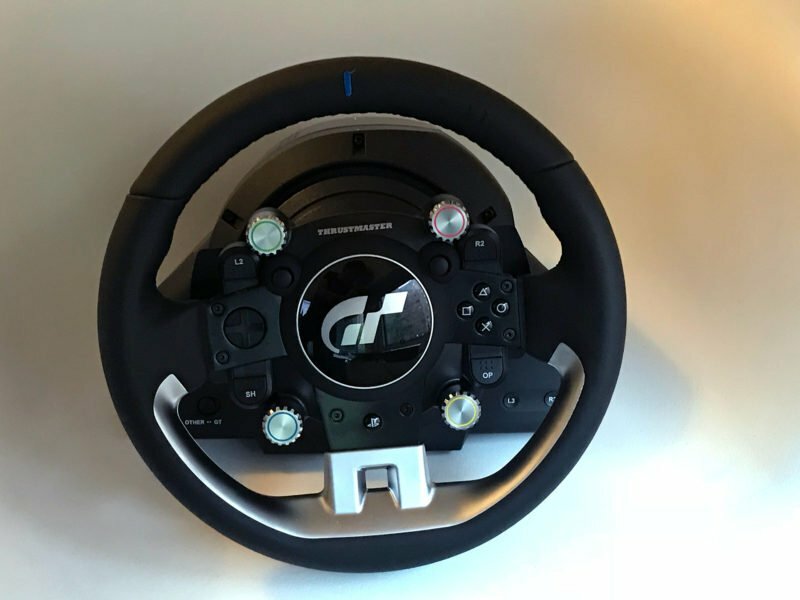 It’s also the best wheel for Gran Turismo Sport. In a money-no-object world, it’d be an easy choice. As is though, the T-GT is asking an $800 question. Its pedals are disappointing in this price range, and some of its best features are useless on any game not rhyming with Man Furismo. For those that bleed the red and blue of Gran Turismo, this is the wheel to have. If you’re the sort of sim racing enthusiast that enjoys a multitude of titles however, you’ll need to weigh your options carefully. Very expensive, but provides the best option for GT Sport players. If you play other racing games, T300 is 80% of the experience for 50% of the cost. Smells of leather when you unbox it. Very quiet motor, satisfyingly clicky buttons. Feels built to last. PS4 and PC only. Expensive transducer is GTS-only. Conversely, transducer is very cool when it’s working. Plenty of GT-specific features, including a surprising one: two analog sticks! The T-GT pushes the limits of non-direct drive prices, for benefits that are largely only accessible on one game.